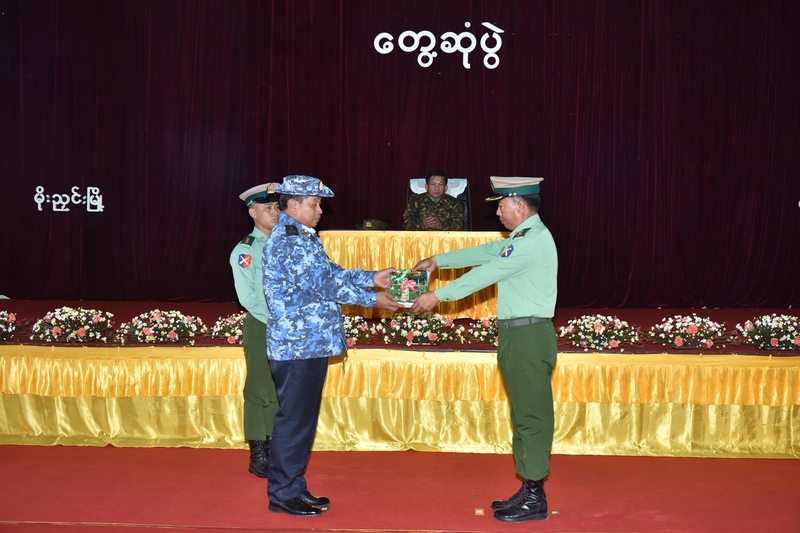 Commander-in-Chief of Defence Services Senior General Min Aung Hlaing this morning and afternoon met officers, other ranks and families in Mogaung Station and Mohnyin Station of Northern Command separately. 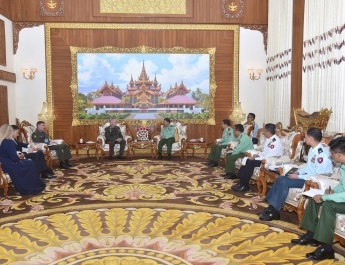 Also present at the meetings were his wife Daw Kyu Kyu Hla, Commander-in-Chief (Navy) Admiral Tin Aung San, Commander-in-Chief (Air) General Maung Maung Kyaw, senior military officers from the Office of the Commander-in-Chief (Army), Commander of Northern Command Maj-Gen Teza Kyaw and officers, other ranks and families of stations. 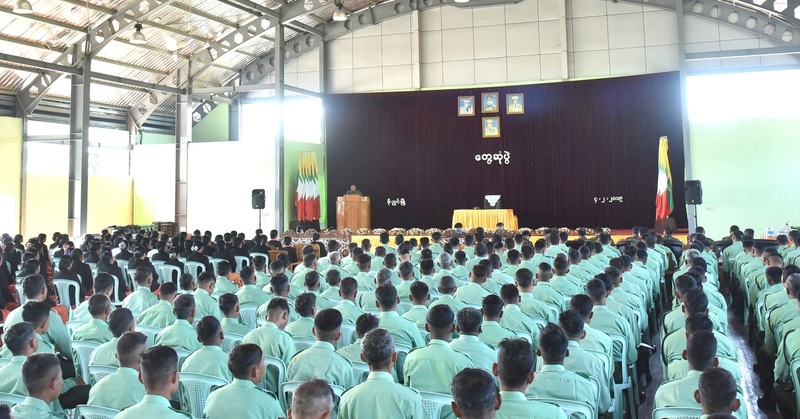 In his speeches, the Senior General said the Tatmadaw is mainly responsible for defending the State. As it must have capability to conduct conventional wars in discharging defence duty, the Tatmadaw is being built as a Standard Army. In addition to upgrading the Tatmadaw (Army), necessary war vessels are built for the Tatmadaw (Navy) while necessary aircraft are upgraded for and added to the Tatmadaw (Air). Advantage of aviation and advancement of electronic technology contribute much towards decision of battles in the modern wars. 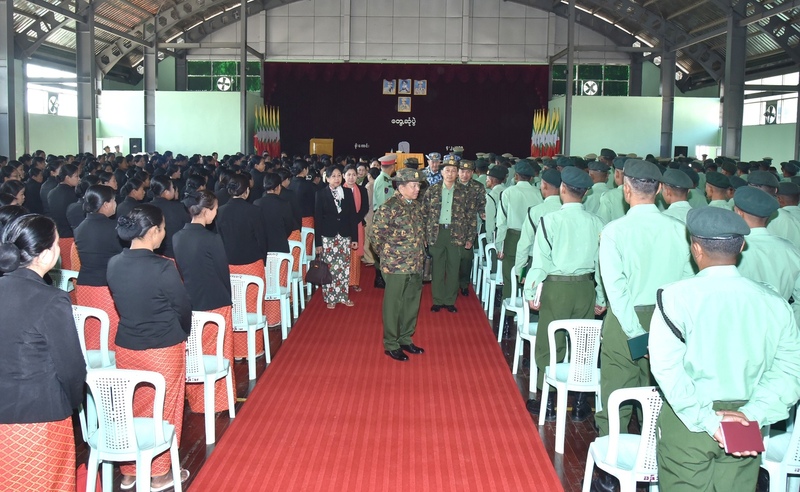 Servicemen are sent abroad to learn modern technologies under scholarship plan while those servicemen are under systematic training at the training depots for enhancement of their capability. Taking lessons obtained from the training sessions, it needs to effectively apply experiences, weak and strong points in the practical fields. The Senior General stressed the need to correctly carry out daily tasks under the procedures to have training skills. 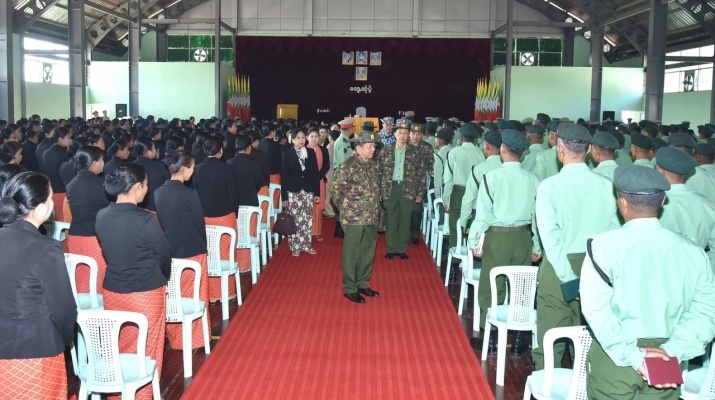 Likewise, the Senior General said that emphasis is being placed on education promotion of Tatmadaw members. He stressed the need to take practices of healthy lifestyle and foods in order to have health and fitness in the battlefield. Hence, they have to take the prescribed physical exercises on a daily basis so that they will have combat ready. 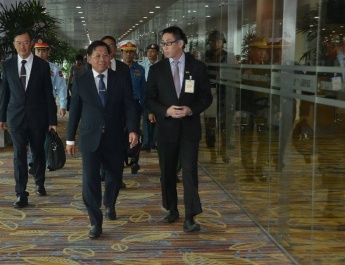 The Senior General said Tatmadawmen need to have suitable living standard based on their ranks and should have equal ratio on income and expenditure. 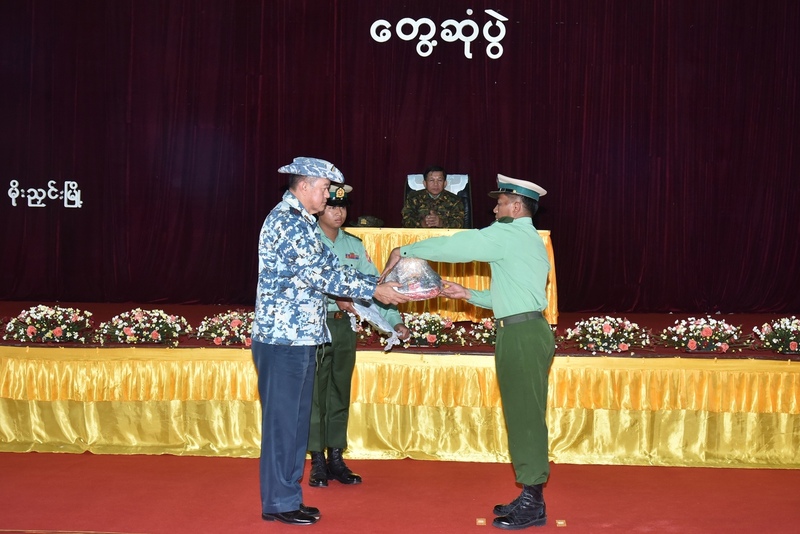 The Senior General said that he has provided the basic requirements of food, clothing and shelter to Tatmadaw members as much as he could. Moreover, it is necessary to operate military-owned agriculture and livestock industries for the welfare of Tatmadawmen and families and therefore, everyone needs to carry out manageable agriculture and livestock industries. The leaders at the different levels should properly administer their subordinates through parental spirit and commander spirit with sympathy. The use of alcohol, cigarette, chewing betel quid and narcotic drugs, which can harm the health, must be abstained at all. Tatmadaw members and local ethnic people should live together through thick and thin as they are in the same boat with spirit of Myanmar. 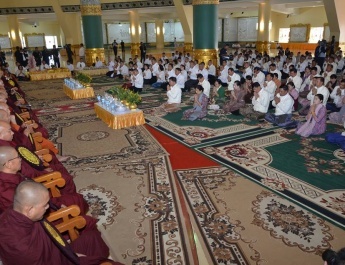 They should try to build the Tatmadaw on which all the people can rely. Afterwards, the Senior General presented foodstuffs for the officers, other ranks and families of the stations and the wife of the Senior General, cash awards for the station maternal and child welfare association through officials. The Commander-in-Chief (Navy), the Commander-in-Chief (Air) and senior military officers from the Office of the Commander-in-Chief(Army) handed fiction and non-fiction books, publications, sports gear and foodstuffs through officials concerned. After the meetings, the Senior General and wife and party cordially greeted officers, other ranks and families. 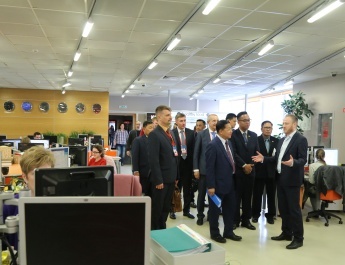 In meeting with departmental officials in Mogaung Township and Mohnyin District, the Senior General explained needs of earning income by producing advanced domestic products based on agriculture and livestock breeding with the use of available electricity, leadership of relevant officials for conducting agriculture and livestock breeding tasks suit-able for the region, fairness in administrative matters, collaboration in promotion of educa-tion for local people, prevention of drug abuse as much as possible, and participation of the Tatmadaw in the regional development tasks.